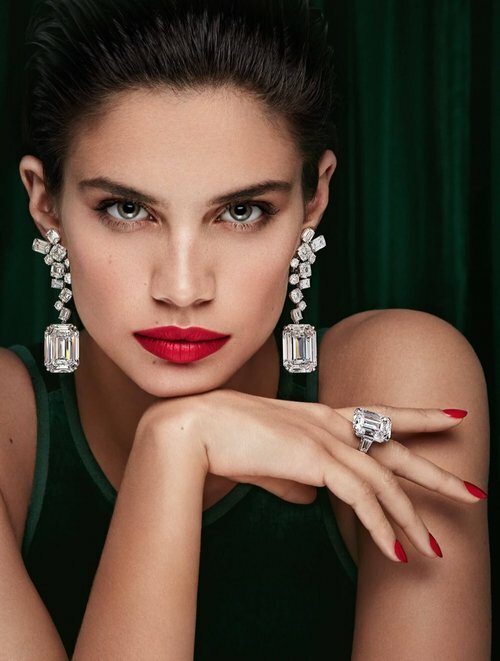 Portuguese model and VS Angel Sara Sampaio is the new face of Graff Diamonds.Lensed by Patrick Demarchelier for Graff's Green Lady campaign Sara shines wearing a pair of 50 carat emerald cut diamond earrings as well as a 35 carat emerald cut D Flawless diamond ring. The stone is the third largest diamond in the country's history and the 14th biggest ever discovered worldwide, according to the Rapaport Group, the jewelry auction organization that helped bring the stone to auction. Note that the Rapaport Group is also a leader in fair trade and ethical diamond mining. The 'Peace' diamond arrived in New York for the December 2017 auction with a cloud over its head. At an earlier auction in Sierra Leone, the diamond brought only $7.8 million at auction and did not meet the floor price. Because the 'Peace' diamond brought even less money at $6.5 million in New York than the $7.8 million rejected in Sierra Leone, disappointment is understandable. “What is the value of the life of a child in Sierra Leone? What is the value of clean water? That’s the value, that’s here. And that’s what Laurence Graff is buying,” said Chairman of Rapaport Group, Martin Rapaport. Note that I'm not clear if Rapaport's comments came before or after the sale. But they appeared in a March 5, 2018 article on Africanews.com, talking about Sierra Leone's history in blood diamonds. According to World Bank data, Sierra Leone’s gross national income per capita stood at $620 in 2015. Related. This story is unfolding in several parts, one more interesting than the next. This is the first chapter -- modified tonight based on new research.